He didn’t come. Now you’re alone. We told you so. Now you’re alone. Her sisters’ admonitions taunted in rhythm as the big iron wheels of the steam engine began to roll, and the train hissed and chugged past Robin Wenghold. She braced herself against the strong, hot wind and gripped the handle of her valise so tight her fingernails dug into the palm of her hand. Squinting against the afternoon sun, she limped to the end of the platform that ran the length of the stone depot. Heat shimmered above the silver tracks which stretched as far as she could see in one direction, and a twist of dust skittered down the street when she peered toward town. Why wasn’t he here? He promised. Had he discovered her infirmity and changed his mind? A sleek, black cat occupied the one long bench on the platform, and Robin pushed it aside so she could sit. Her bad leg throbbed, and she longed to rub the pain away, but even after all these years her mama’s voice echoed in her mind. You needn’t draw attention to yourself, Robin. Your infirmity is obvious. Learn to bear your cross without pity. The cat nudged its head under Robin’s elbow. “And for whom are you waiting, mister bad-luck kitty? Have you been jilted, too?” A steady purr vibrated beneath her hand while she stroked the cat’s warm back. If her papa were here he’d no doubt make a joke about his little bird and a cat occupying the same space like long-lost friends. But then, if Papa were here she wouldn’t be in this predicament—stuck in hot, windy Kansas waiting for an uncle she’d never seen to come to her aid. Robin sighed. Sittin’ in a stew won’t fill a man’s belly. Papa’s words. And Papa was right. Worry wouldn’t get her any closer to her intended destination. She stood, and the cat jumped to the floor then sat on his haunches, switching its long tail against the splintery boards. Robin bent and patted the downy soft head. “Suppose you could take me home with you if my uncle doesn’t come? At least I’d have someone to talk to.” She straightened, adjusted her bonnet, picked up her valise—determined not to panic—and sidled into the depot. One window on the far wall provided the only light in the dark room. The aroma of old tobacco smoke and mildew added to the dread, which lay like a cold biscuit in her stomach. Except for the steady ticking of the large black-framed clock which hung beside the window, silence hovered like a cloud. Even the skinny man behind the counter made no move to acknowledge her presence. “Ahem.” She eyed the empty room. He had to be aware she was the only one there, didn’t he? She drummed her fingers on the counter under his nose. Hot and tired, she had no patience for such nonsense. He didn’t raise his head, but pointed to a crudely lettered sign next to the window separating the tiny office from the waiting room. Ring wonce to git my atenshun. Ring twice if I don’t ansur the first time. If you kant see me, I ain’t here so jist take a seet and wate. This was absurd. Robin tapped the bell with the palm of her hand. Nothing. He didn’t even wince. “Sir?” She stared in disbelief as one bony finger underscored the instruction to ring twice. She dropped her valise to the floor, moved the bell in front of her and with determination hit it two times. “Name?” The little man licked the end of his pencil and peered from under a green visor balanced on protruding ears. “Robin Wenghold, sir. R-o-b-i-n. Perhaps you know my uncle, John Wenghold?” She retrieved a letter from her reticule and waved it in front of the man’s face. “He wrote he’d meet me upon my arrival.” She sucked her top lip between her teeth. Mr. Rempel’s bald head turned red and his shoulders shook with laughter. “Well, what do ya know? Kinda late ain’t ya?” He winked. “Pardon me?” How could she be late? Had she misread the ticket? That couldn’t be. The silly man had marked her off his list. Robin gritted her teeth and waited for Carl Rempel to quiet his funny bones. She knew all about the silly ranch name. Papa thought it quite humorous to tell anyone who cared to listen that his family included a nest of little birds—Robin, and her sisters Wren and Lark. But his one and only sibling’s claim to fame was a feather. “What d’ya know. Robin. Feather. That do make me laugh” Mr. Rempel slapped the counter with his hand. Robin clenched her teeth. A lady could only take so much. Uncle John didn’t keep his word. She wouldn’t keep hers, either. She would take the first train home and forget she ever heard of Cedar Bluff, Kansas. She rummaged in her reticule. “Mr. Rempel. I would like to purchase a one-way ticket to Chicago, please.” She counted the money and plunked it on the counter. The man sobered. He took his watch out of his pocket, tapped it on his hand a couple of times, then peered at it from arm's length. “Oh, I’m sorry Miss Robin, ma’am. I can’t sell it to you.” He removed his visor. “But…but…you’re the Ticket Agent, aren’t you?” She pinched the bridge of her nose. He sidestepped around the counter, closed the half door, and hung his visor on a peg on the wall. One crooked finger beckoned her to follow him out of the station, then he locked the door behind them. “Wait! What if he doesn’t come? Where can I go if it storms?” Don’t they have gentlemen in Kansas. Does he plan to leave me here all alone in this strange town? He pursed his lips and kissed the air. “C’mon, Cat. We best see what Mrs. Rempel fixed us good to eat.” The black cat hopped from its seat on the platform, then arched its tail and marched behind the man as he shuffled away from the depot. So much for taking me home with you, fickle kitty. Robin waited until she could no longer see the stationmaster and his cat, then checked the gold watch pinned to her lapel. Four-thirty. One hour since the train chugged away, but it seemed a lifetime. Uncle John still had time to get here before dark. She rotated her shoulders and moved her head from side to side. No need to panic. She sat on the long bench, and massaged her left leg. She would give Uncle John another hour. Mr. Rempel said the storm remained a long way off, and her leg was too painful to attempt to walk any distance. She leaned her head against the rough stone. Did her uncle know she was crippled? Surely Papa mentioned something to him over the years. But what if he hadn’t? Would Uncle John send her back to Chicago? Oh, Papa. If only you could tell me what to do. Hot wind stung her cheeks, and she closed her eyes against the glare of the sun in her face. It wouldn’t do any good to pray, but she did so want Uncle John to get there before the storm. Robin jerked from unbidden sleep. Heat radiated from the stone wall of the station behind her, and perspiration trickled down the side of her face. She limped to the end of the platform to search once more for any sign of her uncle. Another glance at her watch revealed a mere forty-five minutes had passed. Yet, in the short measure of time, the storm had crossed Mr. Rempel’s whole lot of hills. Ever-changing clouds scudded low across the prairie toward her. Behind them, a roiling, seething mass of green-black turbulence advanced above the horizon and flattened into a seemingly impenetrable wall as it continued its march across the prairie. An eerie silence hovered over the little Kansas town like a pall, yet belied the fury of activity up and down the dusty street. Men ran to untie skittish teams from the hitching rails. Conveyances of all sizes careened past her. Many held wide-eyed women clutching open-mouthed babes in their arms— infants’ cries swallowed by the pounding of hooves and clatter of iron wheels. She gulped down the growing knot of fear. To venture forth amongst such bedlam would be foolhardy. She needed time to navigate any distance, and time evaded her. Lightning snaked from cloud to cloud, occasionally spearing the ground. Thunder reverberated through the dusty streets. It reminded her of a Fourth of July parade she’d witnessed once—the boom of the bass drum and the vibration of marching feet sensed long before the band could be seen. The sky darkened and long fingers of hot wind hurled handfuls of grit and dirt at anyone who dared to remain within range. Her eyes stung from the debris, and salty tears added to the pain. As quickly as the heat of her tormentors passed, large drops of rain began to fall. She hid her face in her hands and sought refuge against the side of the building. Tiny pebbles of ice assaulted her, then larger and larger ones. She hunched her shoulders to ward off the attack, but they pummeled her painfully. 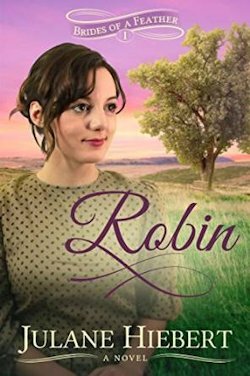 No longer able to contain the storm of fear warring inside her, Robin screamed. Without warning, strong arms wrapped around her middle and pulled her along the wooden platform. The arms tightened, lifted her over the side of the platform and planted her, without ceremony, on her feet. “I can’t run.” Robin yelled above the fury of the storm. Strong hands whipped her around. Her breath caught in her chest. Black hair hung to the stranger’s collar, but curled at the ends, even in the rain. With his face so close she could see the ring of blue around his otherwise dark eyes. A shadow of a beard covered his square jaw. “You’ve got to, ma’am. We’re going to get hit hard if we stand out here like this.” A frown settled between his eyes. He leaned toward her and put his arms around her shoulder, urging her forward. A sudden stillness dropped like lead around them, and in an instant she lay against the rough stone foundation of the depot, the weight of the stranger heavy across her. A rivulet of muddy water slid past her cheek, and the scent of bay rum filled her otherwise numb senses. A roar like an approaching locomotive, accompanied by a cacophony of splintering wood and breaking glass sent fear coursing through her. Robin nodded. “I thought he would meet me.” Silver flecks danced before her eyes, and her back and shoulders hurt from the barrage of hailstones. She ran her tongue over her teeth to remove the dirt. What must she look like? “Is he ill? He knew I would arrive today” She pressed her fingers against her forehead. Save him a trip? What kind of man issues an invitation to visit, then sends a neighbor in his stead so he can save a trip? If only she could sit before her legs buckled. Though his lips moved, the swish of her pulse drowned out his words. She attempted to smile as a dark veil dropped over her eyes. Thank you for providing the first chapter. It is absolutely delightful! I am looking forward to reading, 'Robin'.